Kick off your visit on the 26th (Mon): look for gifts at King Island Dairy, then visit a coastal fixture at Cape Wickham Lighthouse, and then kick back and relax at Cape Wickham Links. Get ready for a full day of sightseeing on the 27th (Tue): take in the exciting artwork at King Island Kelp Craft, then ride a horse along King Island Trail Rides, then view the masterpieces at King Island Cultural Centre, and finally enjoy the sea views from Currie Lighthouse. To see maps, photos, reviews, and other tourist information, use the King Island itinerary tool . Hobart to King Island is an approximately 9.5-hour flight. Cap off your sightseeing on the 27th (Tue) early enough to travel to Wynyard. Wynyard is a rural town on the north-west coast of Tasmania, Australia, about 17km west of Burnie. Kick off your visit on the 28th (Wed): visit a coastal fixture at Table Cape Lighthouse Experience and then take a memorable drive along Boat Harbour Beach. To find photos, more things to do, traveler tips, and more tourist information, read Wynyard trip tool . The Route module can help you plan travel from King Island to Wynyard. Expect a daytime high around 14°C in August, and nighttime lows around 1°C. Finish up your sightseeing early on the 28th (Wed) so you can go by car to Kayena. Kick off your visit on the 29th (Thu): take in the exciting artwork at Tamar Valley Art Shack, learn about winemaking at Holm Oak Vineyards, do a tasting at Iron Pot Bay Vineyard, learn about winemaking at Tamar Ridge Cellar Door, then learn about winemaking at Loira Vines, and finally get some fabulous bargains at Lavender House The Perfumery. Get ready for a full day of sightseeing on the 30th (Fri): do a tasting at Moores Hill Estate, then do a tasting at Bay of Fires Winery, and then learn about all things military at Low Head Pilot Station Maritime Museum. To see ratings, photos, more things to do, and other tourist information, refer to the Kayena holiday builder tool . Getting from Wynyard to Kayena by car takes about 2 hours. In August, daytime highs in Kayena are 13°C, while nighttime lows are 1°C. Wrap up your sightseeing on the 30th (Fri) early enough to travel to Coles Bay. You'll get in some beach time at Friendly Beaches and Wineglass Bay. Step off the beaten path and head to Devil's Corner Cellar Door and Honeymoon Bay. Take a break from Coles Bay with a short trip to Melshell Oysters in Swansea, about 46 minutes away. Spend the 1st (Sun) exploring nature at Freycinet National Park. The adventure continues: visit a coastal fixture at Cape Tourville Lighthouse, learn about winemaking at Gala Estate Vineyard, take in the waterfront at Coles Bay Jetty, and tour the pleasant surroundings at Wineglass Bay Lookout. To see where to stay, ratings, photos, and other tourist information, read Coles Bay trip planner . Traveling by car from Kayena to Coles Bay takes 3 hours. Wrap up your sightseeing on the 3rd (Tue) early enough to drive to Hobart. Eschew the tourist crowds and head to Seven Mile Beach and Puddleduck Vineyard. The adventure continues: examine the collection at Museum of Old and New Art, take in the spiritual surroundings of St. David's Cathedral, awaken your taste buds at some of the top wineries in the area, and take a stroll through North Hobart. For other places to visit, photos, ratings, and tourist information, you can read our Hobart trip planner . You can drive from Coles Bay to Hobart in 2.5 hours. Another option is to do a combination of taxi and bus. Expect a daytime high around 18°C in September, and nighttime lows around 7°C. Finish your sightseeing early on the 6th (Fri) so you can drive to Port Arthur. 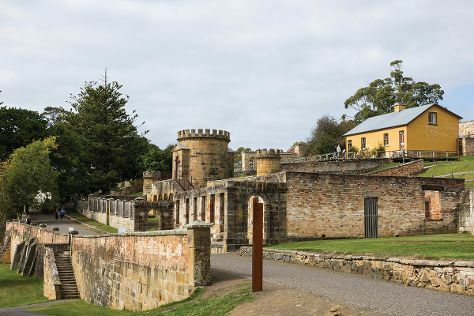 Kick off your visit on the 7th (Sat): get to know the fascinating history of Port Arthur Historic Site, make a trip to Australian Convict Sites, and then steep yourself in history at Model Prison. Keep things going the next day: look for all kinds of wild species at Lime Bay State Reserve. To see ratings, more things to do, and tourist information, read Port Arthur online trip itinerary maker . Getting from Hobart to Port Arthur by car takes about 1.5 hours. Other options: take a bus. In September, daytime highs in Port Arthur are 18°C, while nighttime lows are 7°C. Wrap up your sightseeing by early afternoon on the 9th (Mon) to allow time for the car ride back home.